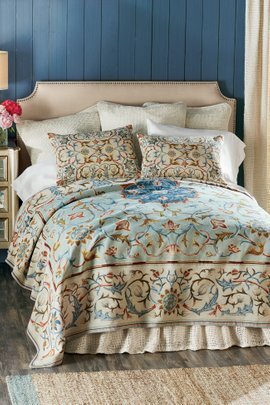 The center of any bedroom or guest room is the bed, so you want to make sure that what covers it is absolutely beautiful. At Soft Surroundings, we are committed to finding the softest, most beautiful coverlets and duvet covers in the world.Your décor is an extension of who you are, which is why we have so many coverlets and duvets to choose from. Whether you are looking for a bold tribal pattern, retro florals, or bright, contemporary colors, our range has something for your taste. In many cases, matching sheets, pillowcases, and shams are also available.Because your duvet cover or coverlet covers you while you sleep, we’ve also ensured that our range is made from incredibly smooth, soft fabrics. We even assign a softness rating to our bedding options, just as we do for our clothing. 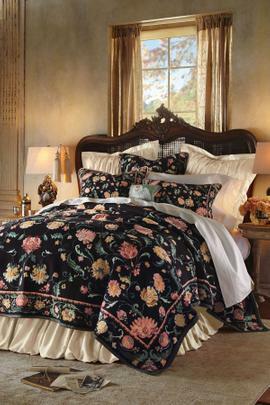 Shop with confidence, knowing that you’ll soon be wrapped in pure comfort at the end of each day.